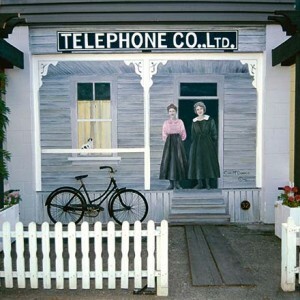 The telephone appeared in Chemainus in 1908. The first telephone company offices were located in a private house on Maple Street but moved seven years later to larger premises. The Victorian residence pictured here served as the telephone exchange for 30 telephones in the community, and was home to Daisy Bonde, pictured on the left. Daisy ran the exchange as a supervisor. Standing at her side is Sophia Horton (Syme), the first paid operator to work at the exchange. From across Willow Street, the viewers feel they have stepped back in time. Two serious young women in laced boots and long skirts wait to greet them on the Victorian porch. A client’s bicycle leans against the weathered clapboard verandah. A real, old-fashioned boardwalk and stairs beckon the visitor to step up for a chat. 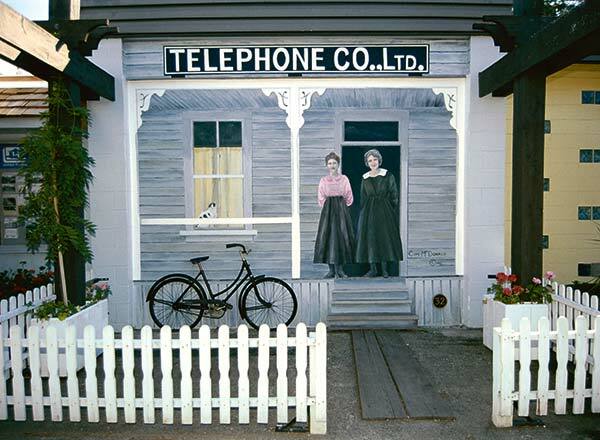 The whole effect is a personal, scaled-down, life-like depiction of a typical Chemainus street scene back in simpler times, when demand required that telephone service be offered during daylight hours only.